Thanks. Really looking froward to it. Porsche have set up an overnight demo for me next week to let me have a proper feel of the panamera. Test drives are never great, point and squirt. Great thread and lots of useful information. Just ordered my car (Wednesday) which should be here April 2018. I currently drive an M5 (second F10) and had ordered the new one due 2018, cancelled the order and have chosen to go down the hybrid route. Could not be happier and really looking forward to the car. Should also say I am a huge Porsche fan and have a few others, 1973 E, 1980 930, 1996 993RS. very nicely specced car! great colour combo. you'll love the Matrix headlights, they are awesome. i bet April can't come around soon enough for you! i borrowed one for a weekend. definitely worth it as you're right, test drives aren't long enough. 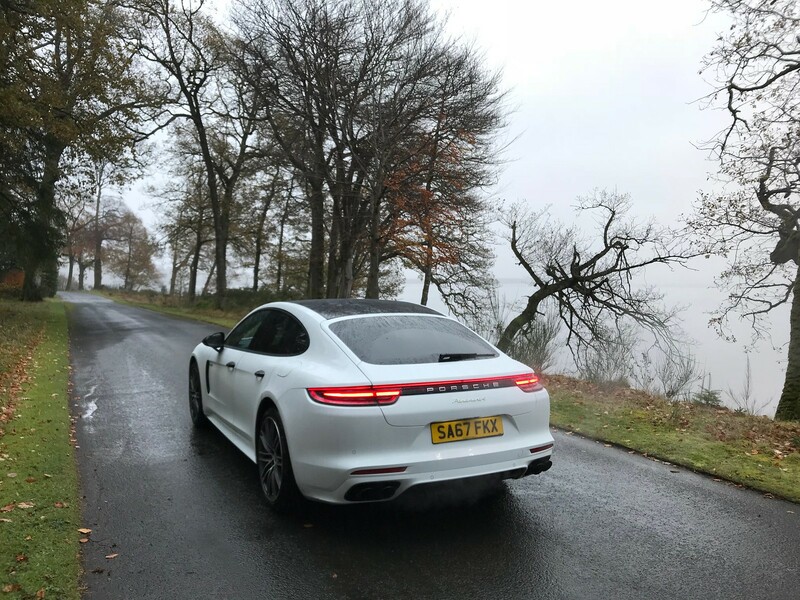 Had the Panamera for two days (my daily is F10 M5) first impressions of the car were good. Much nicer place to be that the 5 series but also felt very low down and less in commend of the car, more of a passenger. Not sure I spent enough time trying to really fine tune the seating position. It was fine but not optimal., I would also say that I felt the seats lacked shoulder / lateral support certainly in comparison to my current and the 18 way seats having sat in these in the showroom will take care of this complaint. The drive is a much more relaxed style and encourages you to sit back and chill. I found myself smiling and really enjoying the electric drive, much more than I expected. At times I will push my current car and take pleasure in the aggression and noise, I found the opposite was more appealing in the panamera. This caused me some concern last night and made me doubt my choice, am I going soft. This morning was a normal day and allowed me to experience the car for what is really is, commute to work, blast along some country roads and allowed the car to behave normally without me switching modes and experimenting. It was all the better for this, an absolute delight to drive. The brakes are better the harder you drive, the steering feels slightly less direct but I am hoping the active steering assists, if not, it wont matter it is still very good just not as direct as my M5. 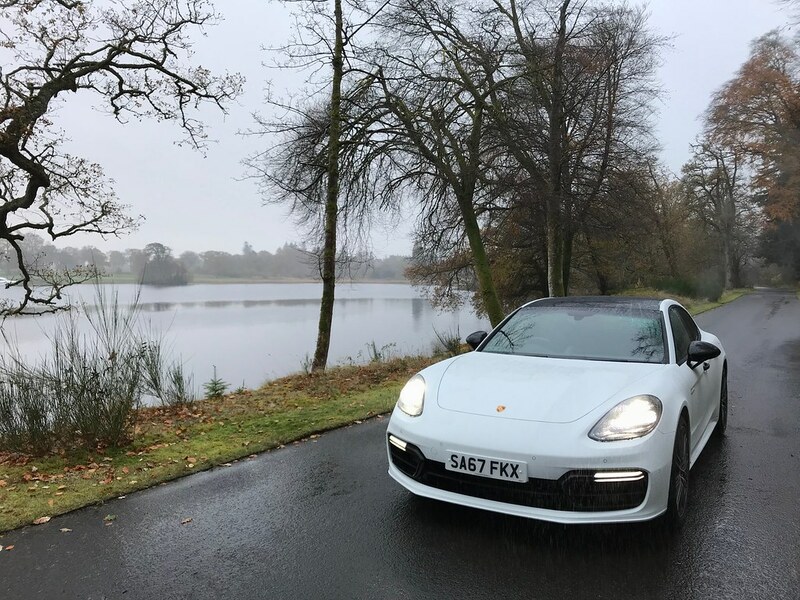 Dropped the car off mid day and immediately jumped into the BMW, they are very different cars and if I am honest with myself I really do prefer the Panamera. The car has two personalities - this is why I love it. 1. Sit back and chill - deliberately reduce the number of green LEDs showing so you max the range and waft around town. 2. Sport + - car hunkers down, exhausts fire into a background grunt and it will punch you through the gears. Is it the MOST involving car to drive? No, a part of me misses the 911 every day. But is it the best compromise for what you get? Hell yes. That is one nice looking road BTW! The road is the exit at Loch Lomond Golf Club, I had a meeting there, good run for the car. This is really great to hear. I'm in a similar boat, coming from a 2014 e63 - i ordered the e-hybrid for delivery in late Jan, but bc i'm in the US have not been able to test drive it (I drove Turbo, base and 4S though). I did get the dealer to agree in writing that when they get their first shipment in in Dec that if i don't like the ride, i can punch out of my deal. Thanks for the great write up. Just combed through all of the posts here in the past hour or so. I'm thinking of changing over to a 4s-e hybrid when the current cayenne s e hybrid's lease runs out. Was wondering if anybody knows how long it would take from ordering at the Porsche store till delivery in Canada right now? Thanks guys, and awesome cars! I just got an email from my porsche. Its telling me activate my porsche account. Does that mean my car is almost released? Mine is sitting in san diego like the rest of them, as far as I know. I placed an order on June 5th for a Panamera E-Hybrid and I'm STILL WAITING!!! I was told that no 2018 E-Hybrid Panameras have been released? now they are saying that the 2018 E-Hybrids will only be released by the EPA next year!!!! if there was a better vehicle for me out there I would have cancelled the order by now. i got that email about 3 weeks before I got my car!! It’s usually a good sign. no idea how long the wait would be for Canada but your dealer should be able to let you know what build slots they have and estimate a delivery after that. Hope the Canadian government aren’t going to hold back the cars like it sounds like the US government are from what I’ve read on here! I know :-( and to top it off my car arrived in Halifax (Canada) at the end of September, so it will have been sitting in the sun, rain and snow in Halifax for at least 3 or 4 months before it even reaches the dealer!!! Interesting that Canadians are also being held up for the 2018 E-Hybrids. I didn't know you were subject to our bureaucracy? My order was placed in March and the car was built the end of June and arrived in San Diego Port on 9/15. No snow and little rain but lots of salt air!! Hopefully your input about next year is not accurate but I really didn't ever think it would take this long! !